It was a short ride tonight, just down the hill to meet R. and friends for dinner, the last one before she and her boyfriend head off to Cambridge. I will miss them, and oh my, I get tired of leaving/people leaving! All good things in her future, though, so I’m excited to see what happens next. I rode home up Charles Avenue, a quick stop to say hi to R. and A. as they enjoyed dinner outside–I think they call that “al fresco” or somesuch. R. said it was going to rain, and about 12 seconds later the skies opened up and dumped a monsoon on the streets. 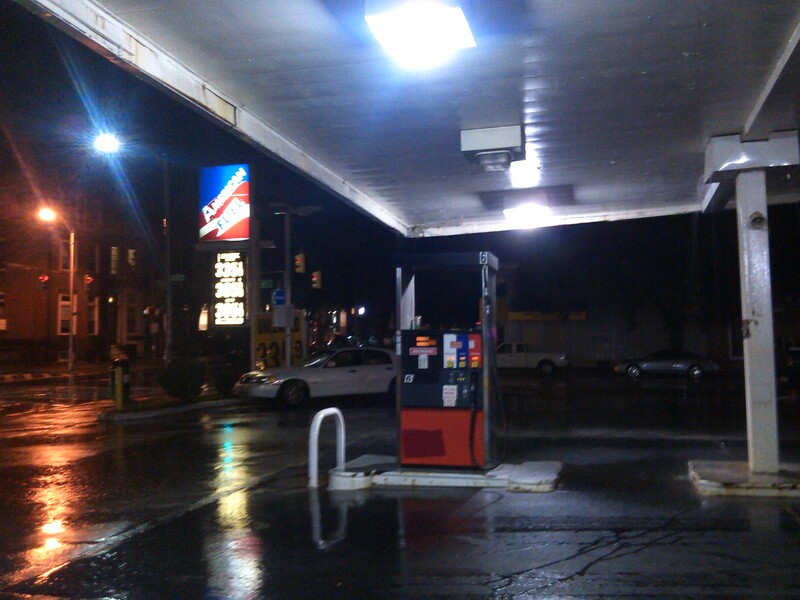 I tried to outrace the raindrops, but I gave up as I crossed North Avenue, ducking under the gas station canopy that reminds me of my old favorite gas station where I spent many a night during just this kind of moment in New Orleans. I waited out the three minute downpour and then O. rode up on her bike, and it all just felt serendipitous. Where are you going? Can I join? Of course. We rode to the bar, I bought us a couple of beers, we toasted another successful community fundraiser, and then it was time to ride home, the air just a bit cooler after the storm, but still thick with Baltimore’s promised humidity, another reminder of New Orleans. That place was home, but now this place is, made that way by riding my bike and being willing to get off and say hi. This entry was posted in bikes, personal and tagged Baltimore, FORCE, friends, home, Mt. Vernon, Station North. Bookmark the permalink. Very nice…. easy to catch your moods. Send a little rain to those who need it. I love this entry. I justr read back on some of my Q mail and saw some messages from tou and thought… How crazy odd and serendipitous is this world… and somehow, we are “friends” who have never met. I still give to the NO library… perhaps I need a new Baltimore libraru to donate to?